Cleveland Area History: Assembling a Museum Exhibit - I Need Your Help! I'm working on an exhibit for the Cleveland Artists Foundation on I.T. (Ihna Thayer) Frary, scheduled for June and July of this year. I.T. Frary is best known as an author and photographer. His works include the classic Early Homes of Ohio, as well as Thomas Jefferson: Architect and Builder, Early American Doorways, They Built the Capitol, and Ohio in Homespun and Calico. Frary was born in Cleveland and attended the Cleveland School of Art (now the Cleveland Institute of Art). He was chief designer at Brooks Household Art Co., and later a desiger at Rorimer-Brooks. Following this, he worked as an independent designer. He went to Texas for a YMCA position during World War I. On returning to Cleveland, he worked at the Cleveland Museum of Art, as Membership and Publicity Secretary. During this time, he wrote and spoke extensively on the architectural heritage of this area. He was on a national advisory board for the Historic American Buildings Survey, and is part of the reason why they were able to locate and document so many significant structures in this area. After retiring, he moved to Winter Park, Florida. Frary exhibited his design sketches with the Cleveland Architectural Club and his other paintings in group shows with members of the Cleveland School, in the 1890s through 1910s. Later, his photographs would be included in major museum exhitions, including the Thomas Jefferson Bicentennial Exhibition at the National Gallery of Art and The Greek Revival in the United States, at the Metropolitan Museum of Art. This is a list of the exhibitions that Ihna Thayer Frary was a part of or that I strongly suspect he was a part of. I've researched Frary extensively in the collections of the Western Reserve Historical Society and the Ohio Historical Society. I'm writing this with the hope that you can help me locate graphical materials relating to I.T. Frary. Items designed/produced by the Brooks Otis Household Art Co. or the Brooks Household Art Co.
Any of four items designed for the Hocking Glass Co. 1, 2, 3, 4. Any paintings or drawings created by Frary. Any photographs or personal materials relating to him and his work. Note that Frary's signature wasn't always the most ledgible. 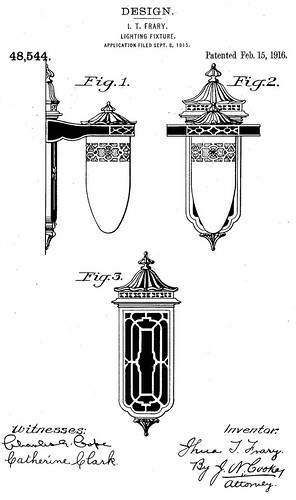 Here are two examples, one from 1897, at left, from this design sketch and one from c. 1935, at right. I've seen several editorial cartoons from c. 1910 signed merely "Frary", so this might be expected. Sounds fascinating.... Will let you know if I come across anything. Please share your findings with us! I am teaching a history of photography course in the fall and would love to include some local photographers - would be interested to know what you find! Do you know of any editions of the Cleveland Architectural Club Catalog other than the one on Archive.org? Does WRHS have these? Crypto, there were six volumes total. The WRHS has five, I believe. Cleveland Public Library has all six. That reminds me, I need to look into the 1910 volume. I found a copy of the "Cleveland Architectural Club Catalog of its Third Exhibition," 1900 on Ebay. Inside the front cover is the ink stamped name "I.T. Frary." Presumably, this small book resided on his bookshelf.